David Barnes uses a palette knife, painting in oils and using a thick impasto technique to produce bold strokes that add strength and texture to his paintings, giving a sculptured feel to his highly textural paintings. 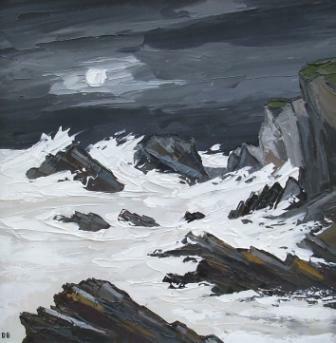 This painting style adds much to the subject in ''Rhoscolyn Rocks by Moonlight''. Strong waves pound the jagged rocks of Anglesey all lit by moonlight and we get a sense of the power of nature. The inspiration for much of David Barnes art work are the mountains of Snowdonia and the coastline of north Wales and Anglesey. As well as painting the dark brooding colours of the north Wales landscape. His paintings are influenced by Welsh artists Sir Kyffin Williams, Gwilym Prichard and Wynne Jenkins. Artist David Barnes is one of a growing number of artists whose modern art works feature at Red Rag Gallery in Bath. Modern art work from David Barnes is regularly exhibited at the Bath art gallery which also offers an extensive choice of modern art, contemporary sculptures and collectible art prints from other present day artists. In addition to Red Rag Art Gallery David Barnes has exhibited in other art galleries in the UK and has modern art work in numerous private and public art collections. Each painting at Red Rag is sourced from the David Barnes artist studio and like all Red Rag British art and Contemporary art it can be shipped worldwide.